1. Heat the olive oil in a frying pan, add the mushrooms and cook for 5 minutes stirring every so often. Add the garlic, lemon juice and season with a little salt and milled pepper and leave to cool. 2. 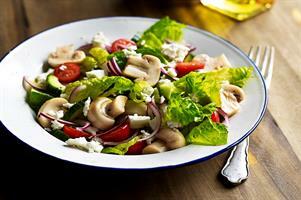 Meanwhile place the washed and chopped lettuce into a serving bowl and top with the remaining salad ingredients. Pour over the mushrooms with all the juices and toss well. Just before serving crumble over the feta cheese and serve. Try with a few pitted and sliced black olives.